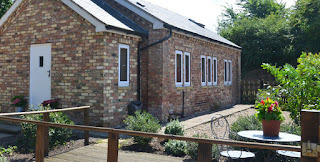 Apple Tree Cottages offer a range of self catering accommodation in Saltmarshe. The hamlet is a short distance from Howden in the beautiful countryside of East Yorkshire. The four and five star rated properties offer luxurious furnishings and are perfect for exploring Beverley and York. Salmarshe is the perfect base for exploring the local area. For those who enjoy history, there are museums in York, Hull and Scunthorpe and towns which are within easy travelling distance. There are also beautiful stately homes in the area that include Castle Howard, Harewood House, Sledemere House and Burton Agnes to name but a few. People can shop to their hearts' content in the very accessible towns of York, Leeds, Sheffield, Hull, Harrogate and Beverley and there are lots of lovely old market towns nearby such as Howden. Golfers can play at one of the several clubs to be found locally and for polo enthusiasts, there are two recently formed clubs 15 minutes away by car. The 'Farm Stay' is suitable for country lovers as well as those who like historic houses, places of interest, shopping expeditions and the sea. The coast is 45 minutes away.